Taking its name from its original trade route, the word satin stems from the city at the beginning of Silk Road, the Chinese port town of Quanzhou, which, in medieval Arabic, was called ‘Zayton’. As the sheeny fabric traversed the world it became a fixture in the wardrobes of the world’s upper echelons – the stuff of royal trousseaus, Marie Antoinette’s court, Hubert de Givenchy’s bow-fastened ball gowns and the full-hipped skirts of Cristóbal Balenciaga. However it was seen in more contemporary iterations at this season’s shows. There, heavy satin came by way of candy colours and jewel-tones, tapping into the truly escapist fantasy of the fabric’s history. These hopeful hues diverged from the practical armour we’ve donned of late – they represent, as Miuccia Prada explained backstage, “a wish of freedom, and liberation and fantasy, and, on the other side, the extreme conservatism that is coming – the duality out there.” It seems that these are sweet-shop satins to soothe the soul in troubled times, but in their boxy shapes, sportswear nods, and sharply tailored silhouettes, they are a flight of fancy grounded in the modern day. With this twist on tradition in mind, Tim Elkaïm, Agata Belcen and Nell Kalonji explore the season’s new sense of heavy satin, taken from AnOther Magazine Spring/Summer 2019. Satin is long-associated with lavish dressing – lingerie, tuxedos, perhaps even both at once. When twinned with a tawdry sheen of another kind, like this PVC patent leather for example, that sometimes staid sophistication is energised. 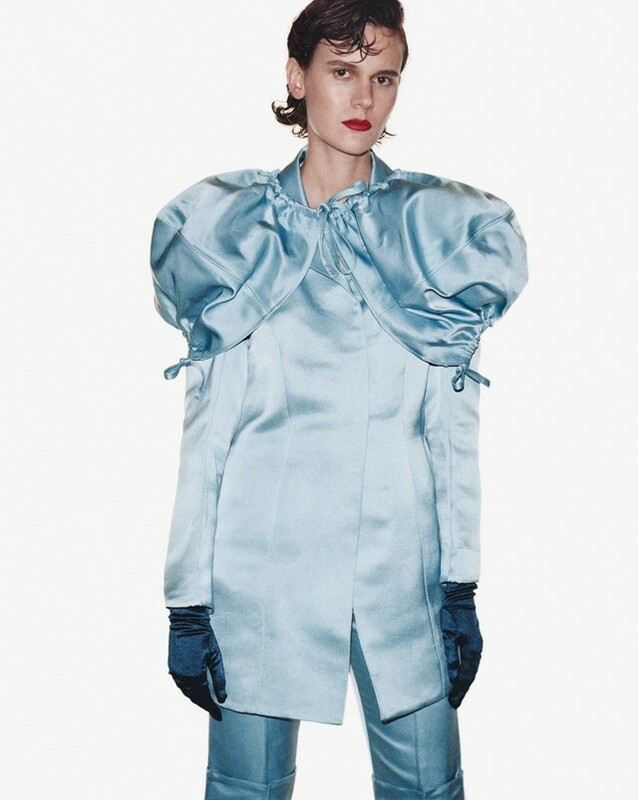 Reconsider the satin ruffle with JW Anderson’s matching shorts-set in clownish proportions. His OTT 80s puffed-sleeves and oversized fluted shorts in oyster silk balance school-girl naivety with a sculptural quality. A play on pretty, Mrs Prada offered duchesse satin in acid green, vermillion, black, rust and her go-to ‘ugly brown’. Bow details, pearly pink and peach brought extra girlishness. 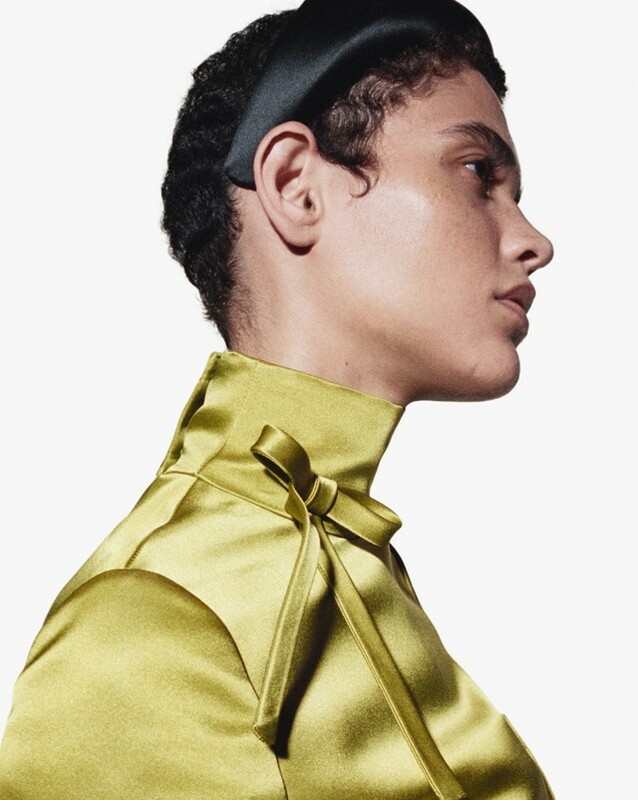 In scuba shapes and too-large headbands the collection embodies today’s political duality that so fascinates the designer. Known for his approach to eco-friendly manufacturing, Richard Malone employed the silks of Italian manufacturer Taroni for his S/S19 confections. It is “the most sustainable company in the world,” says Malone, using little water and acid-free colours, the company supplied Cristóbal Balenciaga and Yves Saint Laurent in the 20th century and still Prada today. In utility-meets-couture shapes Malone offers infinite reasons to go green. In Paul Andrew’s second season as creative director of Salvatore Ferragamo, he wove an unorthodox satin in amidst the butter-soft heritage leathers. 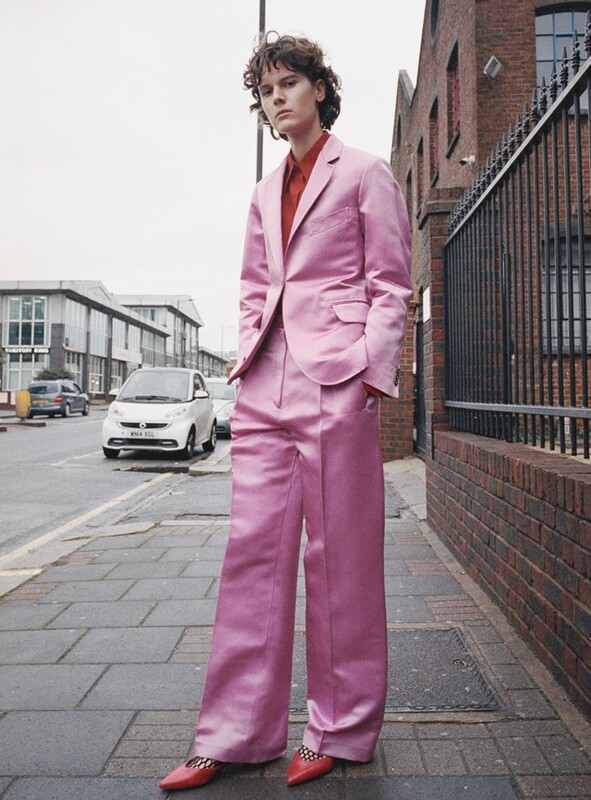 In turquoise, charcoal and this Pepto Bismol pink suit, it lent a colour-jolt to an undeniably luxurious collection. Demna Gvasalia was drawn to the French-based fashion house of Balenciaga for its couture legacy – he’s rewritten the archive’s codes ever since. Twisted proportions and astringent shades offer a rethink on a ladylike ensemble. This story originally featured in the Spring/Summer 2019 issue of AnOther Magazine which is on sale internationally now.